On Friday the 4th May we set off on our trip to Omagh, Co. Tyrone. Larry & Bernie in their newly restored XK120 FHC and myself and Miriam in the MK2 stopping at Slane and Newgrange on our way up. We arrived at the Silver Birch Hotel about 5pm. The National Day itself doesn’t officially start until the Saturday but quite a few cars were already in situ. Shortly after arriving I was told of the sad passing of our dear friend Bertie Baird who we have known ever since the first meeting many years ago from when we first established contact with the Jaguar Drivers Club Area 30. His funeral had only taken place the previous day and sadly I was unaware that Bertie had died. Both he and his wife Anne were regular attendees at the National Weekend and at the Terenure Car Show, he will be sadly missed. AGM & Christmas Lunch – Mission Accomplished! The AGM for the Irish Region of the Jaguar Enthusiast Club was held on Sunday 28th January 2018, at the Garryvoe Hotel, Cork. It was held directly after a belated but much enjoyed Christmas Lunch at the same location. The last overnight event of the year took place on the 2nd and 3rd September, how quickly the year has passed. This time we returned to Wexford for a very enjoyable weekend arranged by Rodney. We met at the Dunbrody Visitors Centre in New Ross at noon on Saturday and drove to Johnstown Castle and Gardens. Whilst the castle is not open to the public at present it provided a magnificent backdrop for our cars. The present castle dates from the 19th century and is now the responsibility of the Agriculture and Food Development Authority. Once again our club took a stand at the Terenure Show and as in many years in the past we were fortunate in getting a car over from the Jaguar and Daimler Heritage Trust in the U.K. 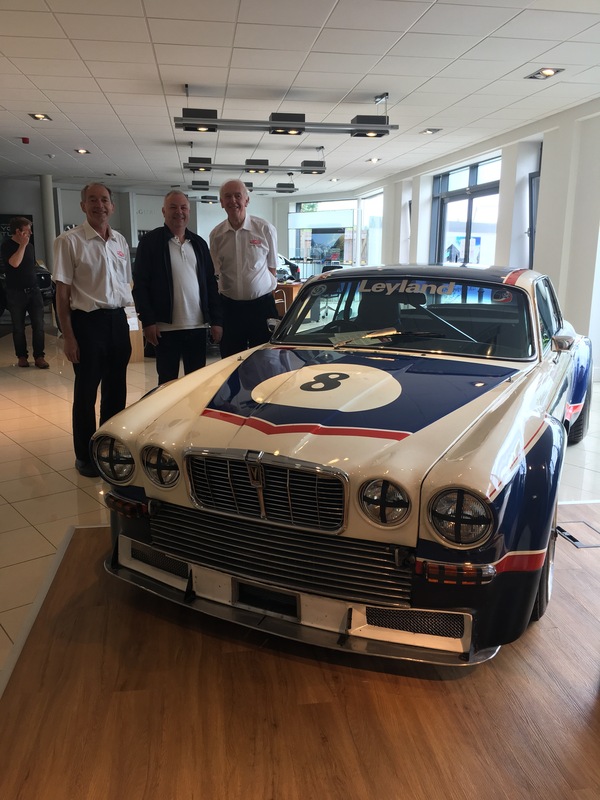 This year the car we chose was the XJ6C 5.3 Broadspeed, with 550BHP it proved to be a great success and as in the past the two volunteers Stuart McEvoy and Rodger Atkinson accompanied the car. This year Spirit Motor Company (our friendly Jaguar dealer) is in the process of a major re-furbishment at their Arena Road showroom and, although this was going on, the Broadspeed was at the showrooms on the Friday and Saturday before the show.